Robert Herron comes down with a touchdown pass as Wyoming faced Hawaii on Saturday at War Memorial Stadium in Laramie. Robert Herron comes down with a touchdown pass as Wyoming faced Hawaii in 2013 at War Memorial Stadium in Laramie. LARAMIE -- Robert Herron spent four hours in "video game mode." Before Wyoming's Senior Day game against Hawaii last Saturday, redshirt senior running back Tedder Easton got up in front of his team and told them to cut it loose. If you want to spin, spin. If you want to juke, juke. If you think you can score, go and score -- a lot. Herron, in his final game on the Jonah Field turf, took those words to heart. “We had a team meeting, and he just got up there and told us to play like we were in a video game. You want to do spins and make all those touchdowns," Herron said after his team's 59-56 overtime victory over Hawaii. The results for Wyoming's senior speedster were spectacular. He finished the game with 11 catches, 141 receiving yards and a career-high four touchdowns. It was satisfying for Herron, but perhaps even more so for his position mates. "For the receivers, this is what we knew we wanted to do. We wanted to go out there and play for him," junior receiver Dominic Rufran said. "If anybody got a game like today, I would want it to be Rob." The grabs came in all shapes and sizes. Herron hauled one in over a defender on the west sideline, skying to catch it at the top of his leap, then land gracefully and keep his feet in-bounds. He caught multiple fades in the corner of the end zone, managing to sneak behind the cornerback and corral passes over his shoulder. And in the beginning of the second quarter, he did what Cowboy fans have come to expect over the past four seasons: catch it, and run. Wyoming junior quarterback Brett Smith tossed a wide-receiver screen to Herron behind the line of scrimmage. The 5-foot-10 receiver grabbed it, sidestepped a few blocks and took off into daylight, as if someone had started frantically pushing the "boost" button on the video game. Herron ran 47 yards, but he could have told you the result as soon as he touched the ball. The four touchdowns served nicely as a cherry on top of an explosive Wyoming career for Herron. In his final season in Laramie, he has 68 catches, 929 receiving yards and nine touchdowns -- all career highs. His recent success means even more, Wyoming coach Dave Christensen said, when you realize where he started from. “I’m really proud of Rob. Rob came here from LA, and it was a tough adjustment for him," Christensen said. "He’s gone through a lot of growth and has matured tremendously. I’m so proud of him, as far as where he is now as a young man and a competitor, having an opportunity to play in the Senior Bowl and having an opportunity to do what he did today for his football team. "He’s a wonderful young man that’s been very, very committed." Now, he's reaping the benefits. Herron accepted an invitation on Monday to play in the Reese's Senior Bowl game at the conclusion of the season. Even with his college eligibility gone, his football career may not be over. But yet, that's not what Herron is focused on. With one game remaining in the 2013 season, he knows a similar effort may be necessary to lift the Cowboys past Utah State. In Logan, Utah, on Saturday, Wyoming (5-6) needs its electric receiver to hit "video game mode" once again. A sixth win and a bowl game hang in the balance. “It maybe could have went a little bit better," Herron said, joking about his big game on Senior Day. "It was good, going out with a bang in my last home game with those four scores. 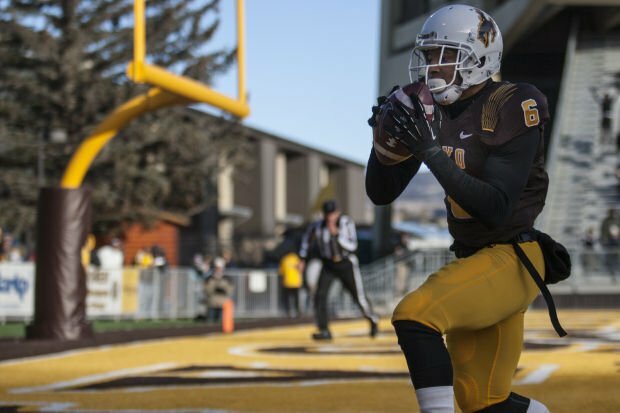 SENIOR DAY: In his final game inside War Memorial Stadium, Wyoming senior receiver Robert Herron recorded 11 catches, 141 receiving yards and four touchdowns in a win over Hawaii. DO OR DIE: At 5-6, Wyoming needs to beat Utah State on the road on Saturday to reach bowl eligibility.